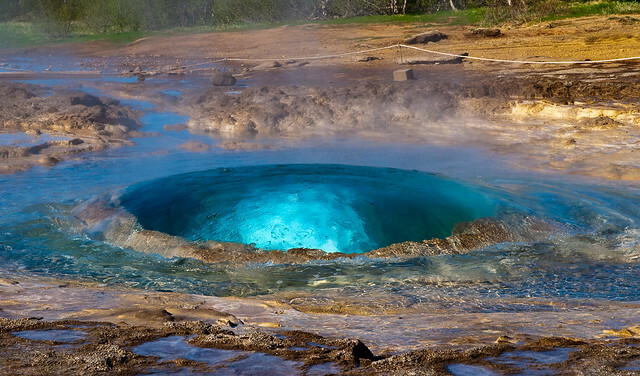 One of the most persistent geysers in the world lies in the Haukadalur valley. This geothermal area was first reported in 1789, after an earthquake which probably created or unblocked its conduit. Eruptions usually occur between 5-10 minutes and involve a single burst reaching a height of up to 30 meters. After regular eruptions the pool is empty but becomes rapidly refilled by flow back and water rising from underneath. It was formed by a stream flowing from the hot springs that flows beneath glacial ice on the flanks of Mutnovsky. Because glaciers on Kamchatka volcanoes have been melting in recent years, the roof of this cave is now so thin that sunlight penetrates through it, eerily illuminating the icy structures within. Devetashka Cave is one of the biggest caves in Europe. According to archaeological research, it sheltered people since the late Paleolithic era. The cave is also known as Maarataor Oknata for its seven different-sized holes in the ceiling, through which sunlight penetrates and illuminates the central hall and part of its two fields. In the beginning of the 1950s, serious explorations of the cave were held, concerning its transformation into a warehouse. The earliest traces of human presence date back to the middle of the Early Stone Age before about 70,000 years BC. The Devetashka cave is among the cave deposits with the richest cultural artifacts from the Neolithic (6th millennium - 4th millennium BC). The cave was declared a natural landmark in June 1996. Meaning "red clay", is located closed to the village of Agios Georgios and near the Louros River. The Saar is a river in northeastern France and western Germany, and a right tributary of the Moselle. It rises in the Vosges Mountains on the border of Alsace and Lorraine and flows northwards into the Moselle near Trier.